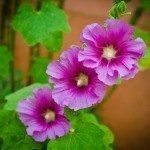 Holly hocks are biennials that come from seed, and not bulb. These will flower in the second year, and then die. These will self seed and continue on that way.